Home > Episode 376: Who’s the “We” Behind Star Wars 7×7? 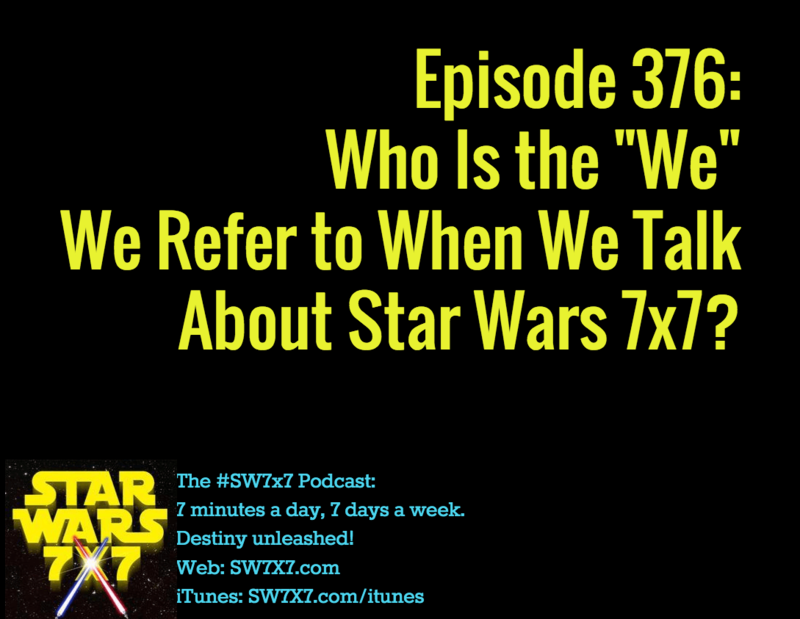 Episode 376: Who’s the “We” Behind Star Wars 7×7? If you’ve listened to the podcast for any length of time, you’ve probably heard me say “we” and “our” when it comes to various things related to the podcast. And I get asked about this from time to time, as to who this “we” is. Sometimes it’s a very straightforward answer. The “we” is myself, Quizmaster Joe, and Scorekeeper Declan for the weekly trivia challenges. Sometimes I’m thinking of YOU, like when I open the podcasts with a statement like, “Today, we’re talking about the Behind the Scenes video from San Diego Comic-Con.” It’s you and more talking. Sure, I can get it started on the podcast, and you can’t talk to me there, but I’m hoping the podcast can start a dialog between us about whatever the topic of the day is. And sometimes – like when I said “our friend Tim McMahon” as I did on this epsiode – it’s a little harder to get at. You could say that the “we” is me and the podcast itself. People ask me all the time how I’m able to pull off a daily podcast, and I don’t know how to answer other than to say the podcast has a life of its own, it has its own energy, and it’s working through me.